Journalling is tough for me. I know a lot of people really recommend it for everything from therapy to Bible Study but I often struggle with it. And then there are those wonderful Bible Studies that have fill in the blank questions – since my head doesn’t work the way most heads work I have trouble with them too unless the question is along the lines of, “Who built Noah’s Ark?”. When my children were newborn I had the traditional baby book and I did a pretty good job chronicling all the firsts – at least for the first child I did a good job. So when I was offered a 5 year journal for moms I thought it was custom made. 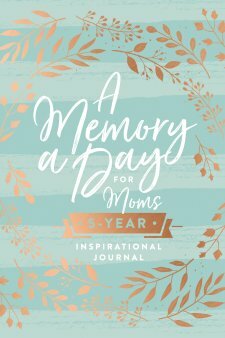 A Memory A Day for Moms is a 5 year journal that is bound in a hard cover which is beautifully embellished with gold-colored vines against a soft blue background. It includes a ribbon so you can easily turn to your page and provides 3 lines for each day to record memories of your family. Three lines is not very intimidating so most of us would return to it day after day to leave a thought or two about what’s happening in our family. Now, there are prompts at the top of each page that may or may not fit what you’re hoping to record when you open the book. Things like, what book your child is reading or how your family could serve others might spark a thought on a dry day. Some of the questions however might derail my journaling, such as what I’m dreading about Christmas or how does my child honor me. I’m sorry but there are just days that I either couldn’t limit the dread to three lines or think of a single honoring characteristic. Still, recording favorite animals or the craziest thing we’ve done would be great to read about in coming years. There’s a Bible verse at the bottom of each page. The front matter says it’s mainly New International Version but there’s a lot of other versions represented as well - NKJV, ESV and NLT are some of the ones I noticed. Overall, I find this journal to be a great idea that I look forward to using and will probably buy for other moms around me. Thomas Nelson, the publisher of A Memory a Day for Moms supplied a copy of this book in exchange for a fair review.